Poupée is a perfume by Rochas for women and was released in 2004. The scent is floral-fruity. The production was apparently discontinued. 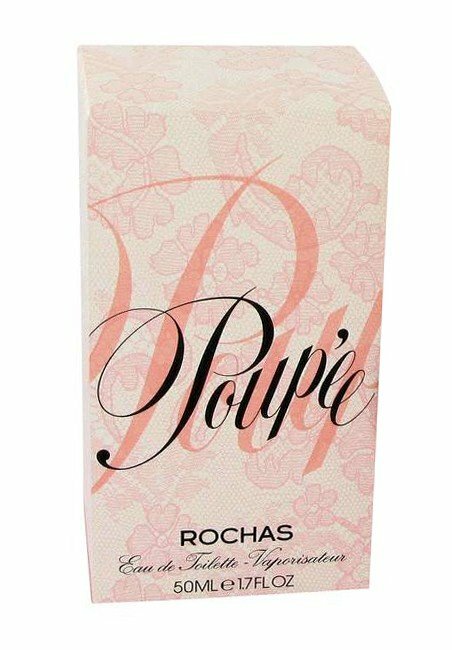 Poup`ee by Rochas is a fragrance worth discovering. It is often overlooked as it's not the most popular Rochas scent, but that doesn't make it any less enjoyable. It is one of those fragrances which should appeal to people with diverse taste. Poup`ee tends to have two distinct phases throughout the composition. The first part is a buttery white floral which later fades into part two, an uplifting and frivolous pineapple scent. In some ways Poup`ee caters to all those in favour of white florals and fruity florals. I found it both fascinating and perhaps a little odd that it opened with tuberose and gardenia and dried down to pineapple. Usually, in a scent pyramid, these notes would be the other way around. Buttery tuberose can sometimes be a struggle to wear in terms of skin chemistry and seasons. Some may feel put off right from the very beginning, especially since it struck me as a youthful, lighter and fresher version of Robert Piguet's Fracas. Do not fear. Once the pineapple accord makes itself known, the tuberose isn't as noticeable. Personally, I find Poup`ee unique and incredibly pleasing. I'm not a massive fan of pineapple, as I don't like its acidic nature, but in Poup`ee it's tolerable. I am very glad to have given this fragrance a fair chance. I would say that the longevity is good and the sillage soft, but not weak. It is best suited to wear during Spring and Summer, and the occasional Autumn days. I recommend. Originally written: July 28, 2012. This opens with a fresh burst of pineapple and jasmin and then moves to an airy gardenia tubereuse and finally a weird neither here nor there waxy nutty finish. It was the finish that finished Poupee for me. I do not understand why such a pretty "Lily Cole" of a fragrance was given such sensible shoes! I gave this to my daughter, who loves it by the way, although she does wear Uggs with her pretty summer dresses. with the Drydown of Pineapple nutmeg and Jasmine can not persude me to like this perfume. is making it like that. I Don't Really care about this Perfume. Write the first Review for Poupée!